We all always love big city people going back to their hometowns. Especially when they can put their skills and experience to good use. In Burden of Truth Joanna Hanley takes on a case of of a group of girls with a mysterious illness in her home town. Where can you stream Burden of Truth? 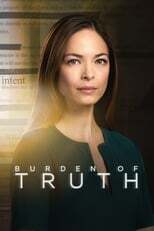 On 2018-01-10 Drama TV Series Burden of Truth first aired on CBC Television. Written and created by Brad Simpson, and produced by ICF Films, Burden of Truth will return and was last broadcasted on 2019-02-27.